Time flies and for all of us that love football we certainly are looking forward to the Super Bowl this Sunday, February 4, 2018, but we must say is also a bit of a drag to have the season come to an end. The action on Sunday will take place at the U.S. Bank Stadium in Minneapolis; the Philadelphia Eagles will take on the New England Patriots. In case you were on a trip to Mars or snoozed out of it for some reason, let’s take a quick step back. The Eagles got to this point by defeating the Falcons 15-10 and then beating the Vikings 38-7; while the Patriots had a solid win over the Titans 35-14 and went on to take a home win over the Jaguars 24-20. 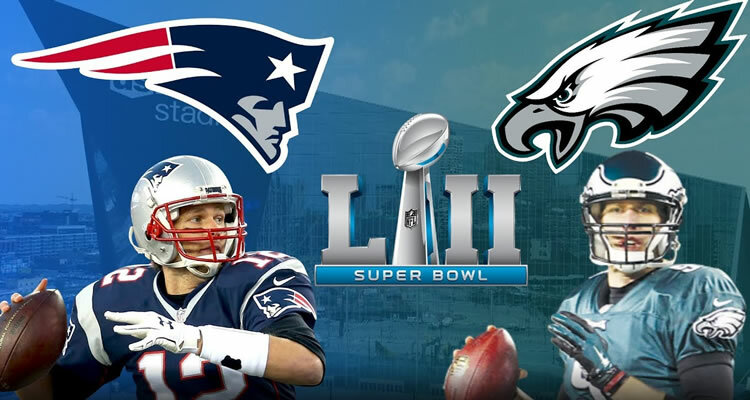 This will be Philadelphia’s third appearance in a Super Bowl, winning it will be a first for the Eagles; the Patriots, on the other hand, have more experience in this sense, they are making their tenth Super Bowl appearance and this is their second consecutive season, if the Patriots win, this will be the sixth Super Bowl win for New England and Brady, the only team so far to have won six times the Super Bowl is Pittsburgh. Because nothing makes football more exciting than having a “few” bucks on the line… as expected, the N.E. Patriots are favorite to win the line, for now, is of -4.5, and so far close to 45% of the bettors are taking the Patriots; the line for the total is at 48 and 58% of bettors are taking the over, which is usually a safe bet in Super Bowl matches. If you don’t feel comfortable betting on the game itself, take a couple of props, sportsbook betting software using AcePerHead.com have an incredible variety of props, some of which are easy money. Oddsmakers and history are on the Patriots side, however, you’d be making a big mistake if you count out the Eagles, let’s start by saying their defense has been great in the last two games, and overall the team has been playing well, showing both a good offense and defense. The Eagles averaged 28.6 points in the regular season. Q.B. Nick Foles, perhaps has a long way to go before reaching the level of a Tom Brady, but he has done a good job so far, he is living his moment, this is his chance of proving what he can do, he is good at leading receivers, he has a good arm, and in general his growing confidence could take him and the team a long way. Of course one of the main things the Patriots have going for them is an excellent offense with Tom Brady leading the way, Brady is a very experienced QB, he knowns very well what his team needs from him and when, but Brady is not on this alone, New England’s offensive game has been consistent, dependable and solid, yet, much has to be said about the Patriots defensive game, although New England’s defense is not bad is the consistency that becomes a concern, if they are not having a good day Sunday the Eagles have enough ability to capitalize on this. New England has covered the spread in 13 straight games when favored by 7 points or less. Tom Brady is a huge factor; experience is also an important part of this game. Even when the Eagles are going through a good moment, the Patriots are superior and they have what it takes to win the game and cover the spread. As we mentioned before, check the props provided by AcePerHead.com, some of them are easy money! Good Luck!